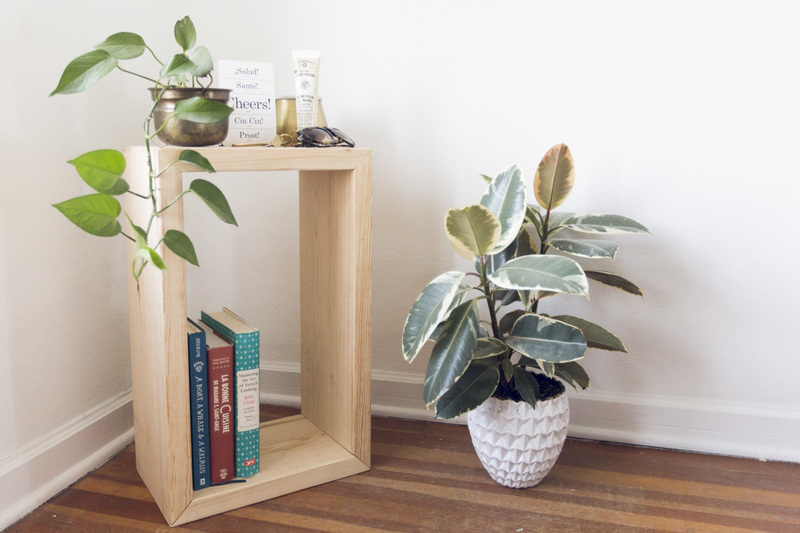 "This DIY side table is simple, serves the purpose, and, in my opinion, looks better than anything I’d seen for sale." My husband and I recently moved, and in the transition, we (obviously) did a lot of apartment rearranging. We shifted furniture to fit our new configuration, and quickly realized we needed a replacement side table. We looked around for something simple and inexpensive to use. After several days of online browsing and stopping in every store imaginable, we realized there wasn’t much out there that’d fit the bill, so I decided to quickly throw something together. 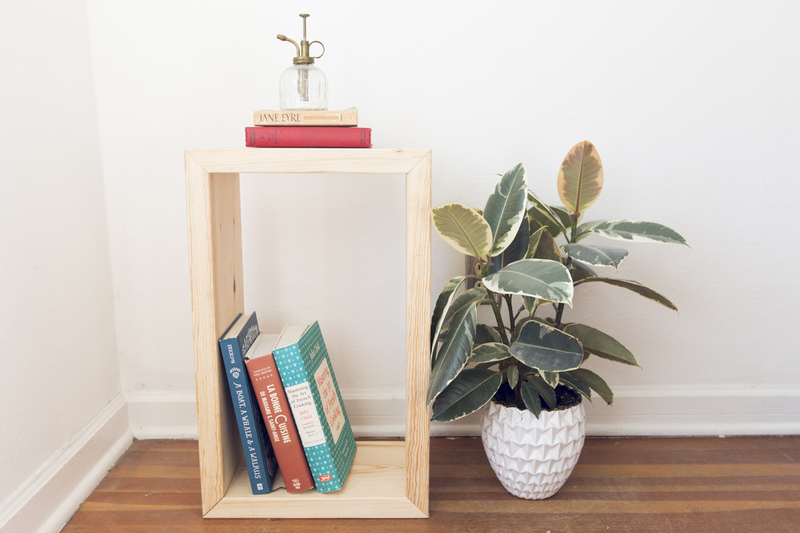 This DIY side table is simple, serves the purpose, and, in my opinion, looks better than anything I’d seen for sale. Plus, it’s a great place to show off my prettier hardcover books. 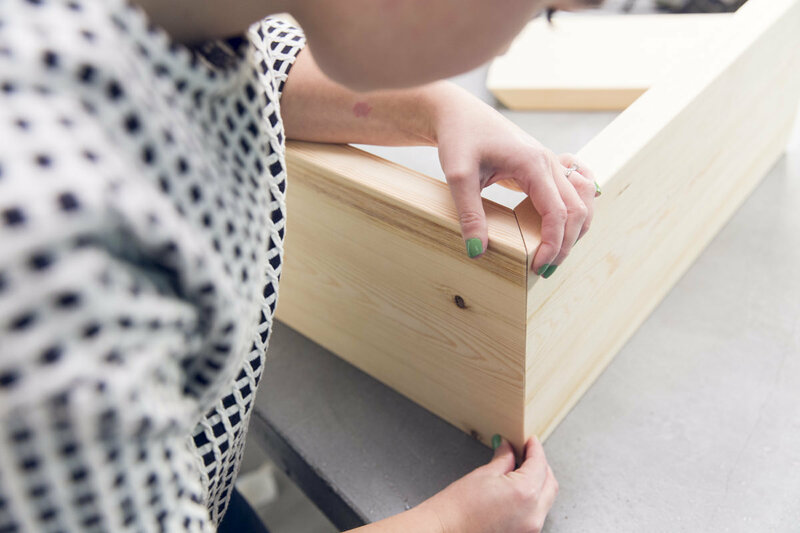 The design for this one was super simple—I actually wound up taking a project I did last year (box shelves for the Dunn DIY studio) and changed up the dimensions. Let’s get to it! Dimensions-wise, we built ours to match our armchair. For the perfect fit in your home, measure the height of the arm of the chair (or sofa) your end table will be next to. As we learned from Keith Miller, the height of your end table should be no more than 2" shorter or taller than the accompanying chair or sofa. Our end table is 24" tall and 15" wide (the 15" was based on aesthetics). I kept things easy and went with nice round numbers—no fractions here. 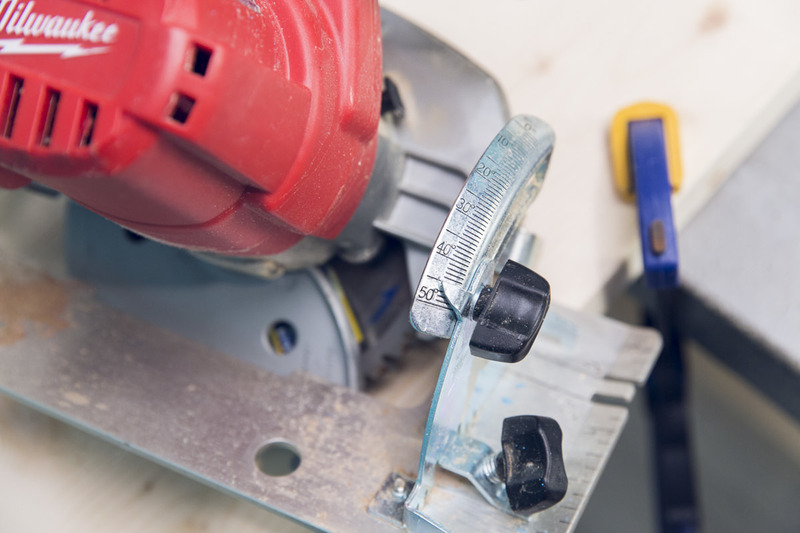 Before you start cutting, adjust your circular saw to a 45° beveled angle. Make sure the depth of the blade is set far enough down that it actually cuts completely through the wood. 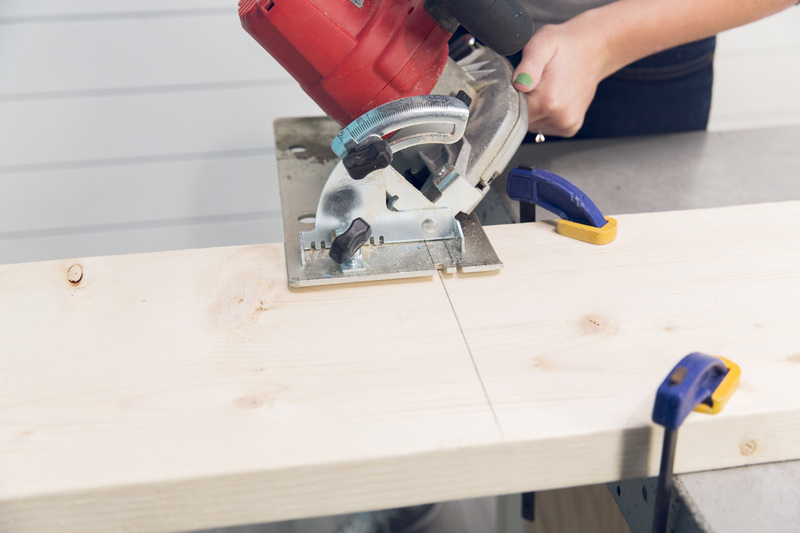 The Milwaukee circular saw has a different mark to line up with for a 45° cut (as opposed to a straight cut), so make sure you line up with that. 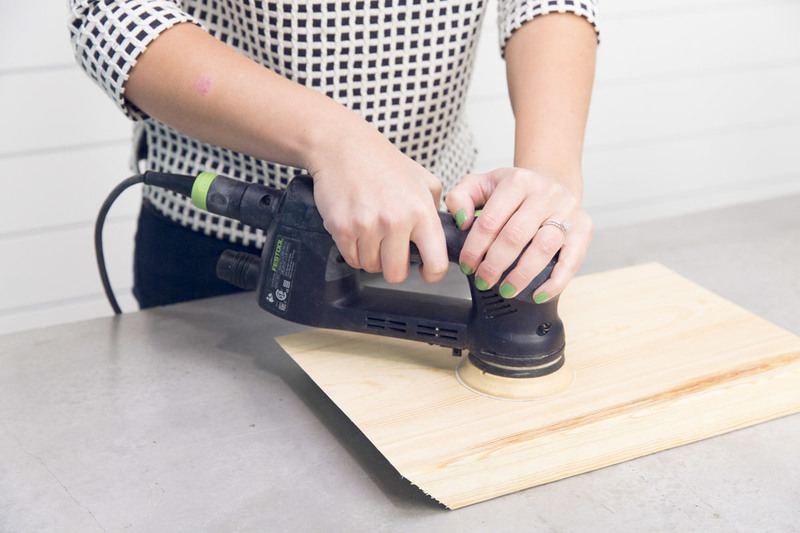 You can always use a miter saw for this, too. Make the first cut along the very end of the board. (This will be the end of your first piece and your starting point for measuring.) 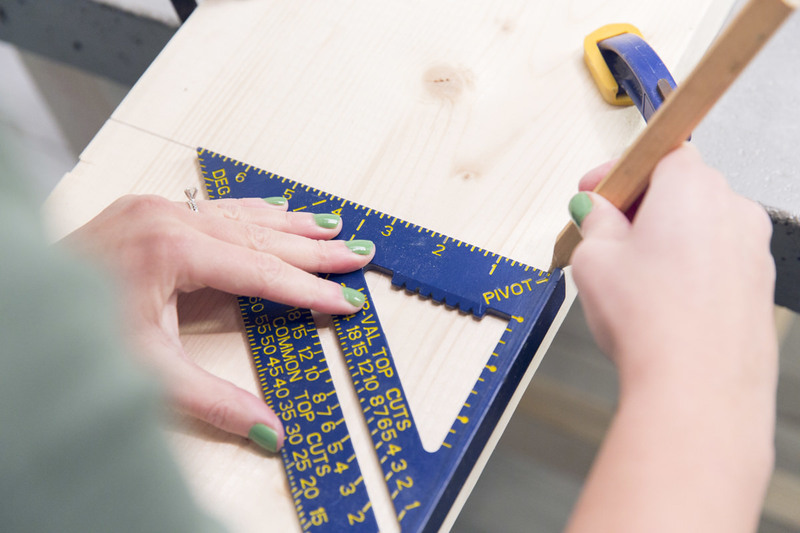 Using a straightedge or speed square, begin to mark two 24" pieces and two 15" pieces. Draw a line all the way across the width of the wood. 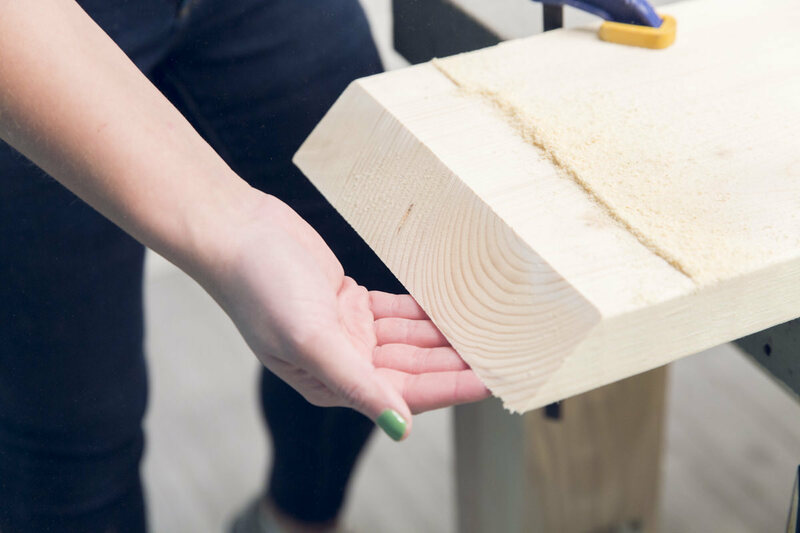 Measure and cut each section individually, otherwise the kerf (the slit in the wood made by the width of the blade) will throw off your dimensions. If you’re using construction-grade lumber like mine, you’re going to want to sand it well (to get it to furniture-grade). 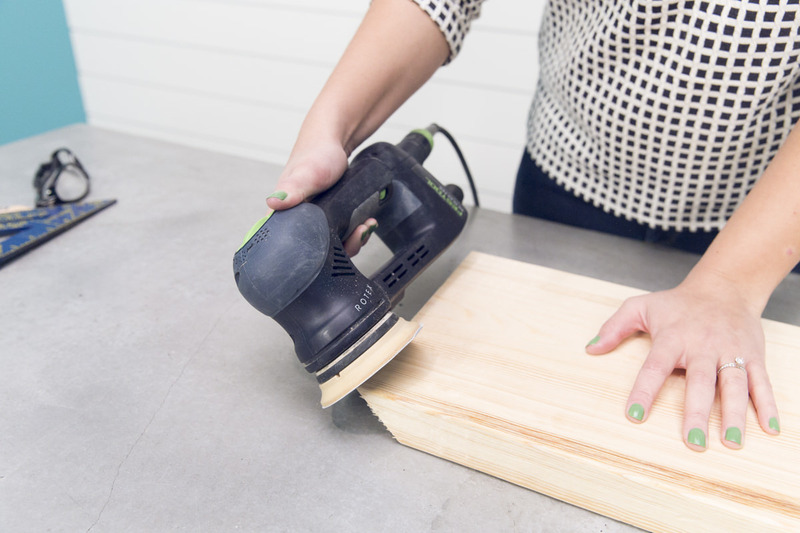 To save time and trouble, use 150-grit sandpaper and an electric sander. Make sure to go over both the cut edges and sand through any stamps or dirty marks. I like 150-grit sandpaper because it's rough enough to remove the major flaws, and it's smooth enough that I don't feel the need to go in with another grit. But it's totally up to you! Sand however much or however little you feel like. I opted to leave the wood natural, but you can customize this however you like. I was tempted to paint the insides like I did with the shadow boxes in the Dunn DIY studio, but I wanted my books and knick-knacks to be the pop of color on display here. Leaving it bare also meant more versatility if we rearrange, redecorate, or move again. You can stain, coat with polyurethane, or follow my lead by keeping things untouched. 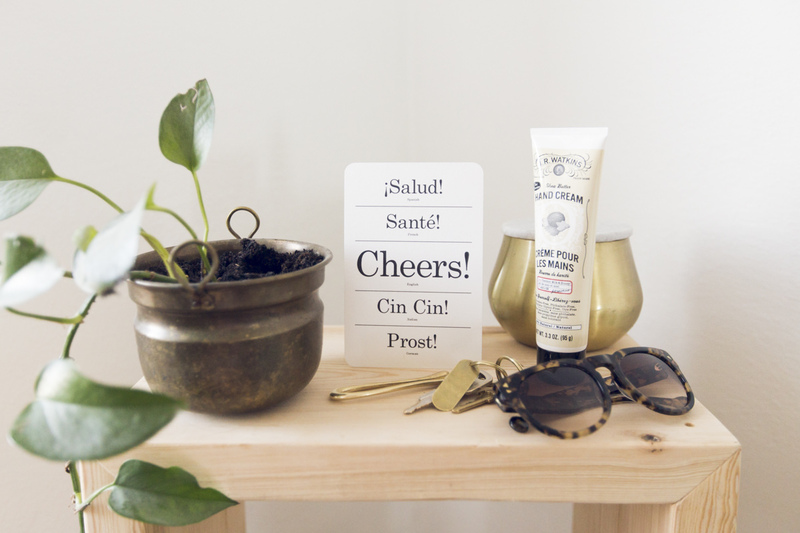 Note: We were going for something temporary for our apartment, but if you want something that's going to last, you should definitely consider a clear finish to keep things clean and un-smudged. My biggest goal for this assembly is to have perfectly lined up corners with perfectly matching seams. I have tried wood glue and epoxy, fast drying glue (that doesn't require much dry time), and glue that needs to be clamped overnight. After having repeated this process some half-dozen times, I have come to this conclusion: all of it mostly ends up the same. It all lands pretty close to perfect, but the extra effort doesn't seem to make a big difference. Even when it gets glued perfectly, the screws will still pull in weird ways and create a tiny bit of overhang. And because we're working with bulkier material than we were for the box shelves, it's harder to manipulate with glue. Most importantly, this is supposed to be a quick and simple project, not your greatest masterpiece. Some imperfections add to the charm. So this is my recommendation: Use some fast-drying glue for this project, because it will give you more grip while you manipulate the wood. Then find a friend to hold the seams together while you pre-drill and add screws. Otherwise, do the best you can with your own two hands. 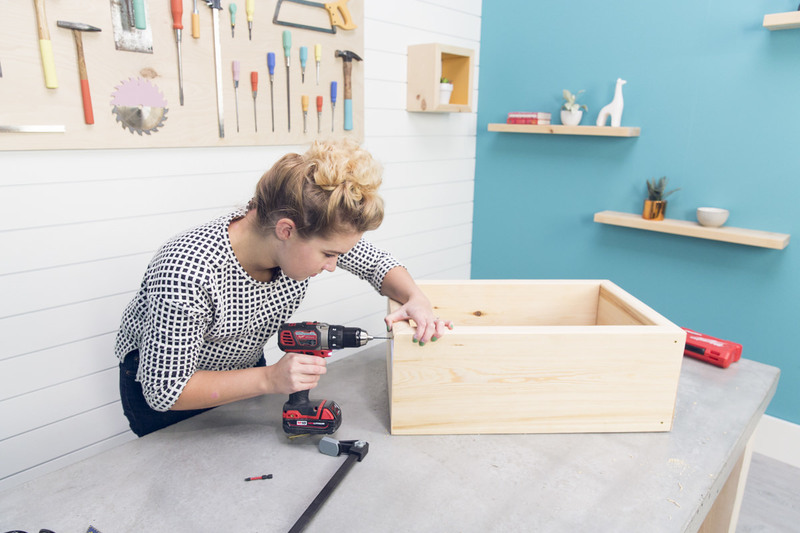 For the pre-drilling, you’re going to want to drill two holes in each corner to connect each piece. Pay attention to where you’re drilling! 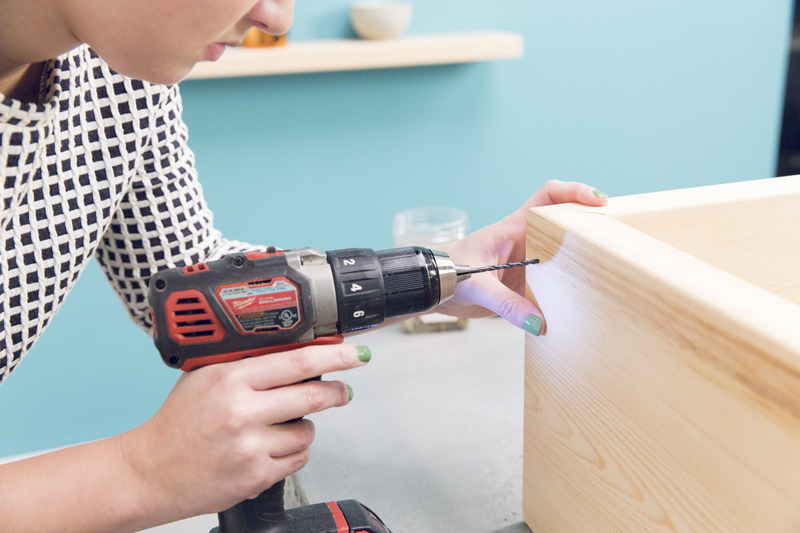 Hide the screws by drilling up through the bottom of the base, and into the sides on the top so they don’t show. Use 2 1/2" screws. And that’s it! The whole thing took less than an hour for me to throw together, and it was affordable—the lumber was less than $20. I’m a huge fan of this piece, which also happens to be extremely customizable. 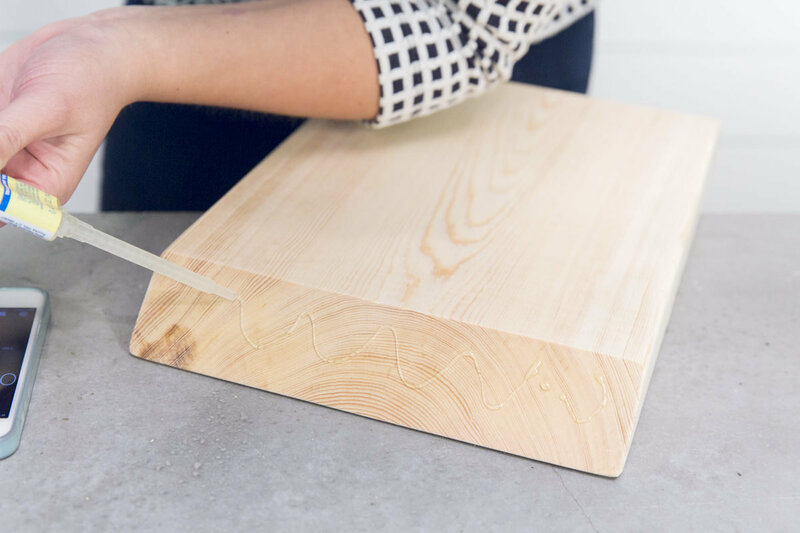 You can go with different sizes and shapes, make it shorter and turn it into a stool, add a shelf in the middle, paint or stain it—there are so many directions you can go with this. 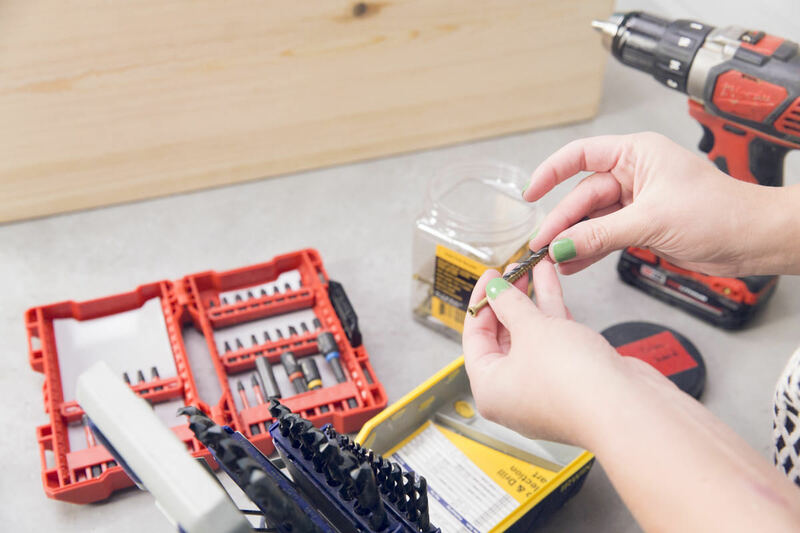 This is one of those win-win projects that does everything you need it to do—and makes you feel super accomplished. Have fun! Yes, you read that right: Jalapeño Lime Honey. It’s the perfect blend of sweet and spicy, and adds a burst of flavor to your savory dishes. Honey infused with jalapeño and lime is perfect drizzled over baked brie, served overtop pork chops, or transformed into a simple syrup for piquant margaritas. Add some light to your summer evenings with this cute little fire pit.